As you heat up the grill and slice the first watermelon of summer, please remember the people who gave the ultimate sacrifice for our country. 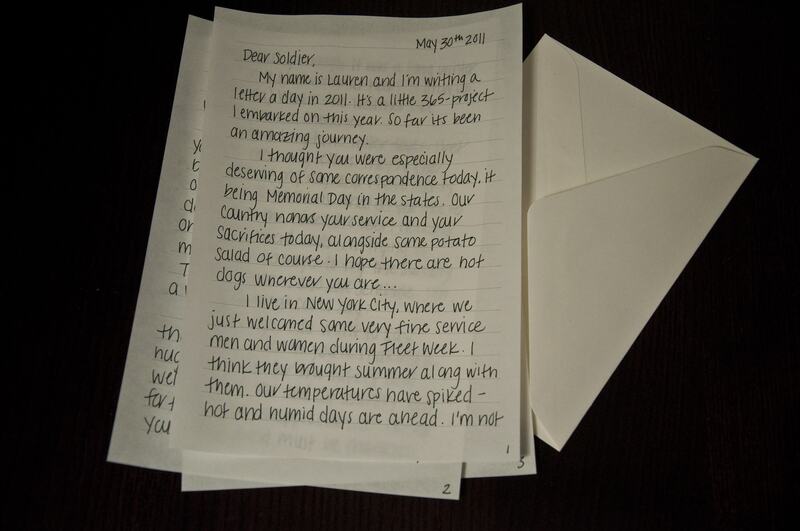 In honor of Memorial Day, today’s letter goes out to a soldier. A Million Thanks delivers letters to soldiers stationed all over the world—more than five million have been delivered! I encourage you to send a letter too–can you think of anyone more deserving? I wonder if he/she will write back… I’m already giddy with anticipation! My name is Lauren, and I’m writing a letter a day in 2011. It’s a little 365-day project I embarked on this year. So far it’s been an amazing journey. I live in New York City, where we just welcomed some very fine service men and women during Fleet Week. I think they brought summer along with them. Our temperatures have spiked—hot and humid days are ahead. I’m not complaining though. It was a long winter and I’m a southerner at heart (I grew up in Florida). What’s the weather like where you’re stationed? I’m a long time letter-lover. I bet you love receiving letters. They’re the best part of my day and I have plenty of other distractions. What do you like to do to pass the time? I’ve been working on my crossword skills. I’m trying to work up the courage to attempt the Sunday Times’ Puzzle. I also love Scrabble. I’m a word-girl, what can I say? Before I go, I do want to say thank you. I know you’re making a huge sacrifice for the safety and well being of me and our country. And for that I am so appreciative! I know your daily grind must be thankless, but please know there are strangers out there thinking of you and hoping for your safe and speedy return home. Thank you again. P.S. If you want to follow my letter-writing adventures (and have internet access) visit www.lettersfromlauren.com. P.P.S. I wouldn’t hate it if you wrote back, wink. Hi! Is the soldier replied to you? Have a nice day.